Which is more damaging to our society, a corrupt/incompetent judge handling a case of constitutional importance or a jury tainted with racism deciding such a case? U.S. v. Eric Parker raises this troubling question, plus many others. Parker is the Madison, Alabama, police officer who body slammed and partially paralyzed Sureshbhai Patel, an unarmed grandfather from India who simply was walking down a sidewalk at the time of his encounter with American law enforcement. We don't have an answer to the question posed above, but evidence is overwhelming that judicial incompetence (or corruption) and juror racism (or blinding ignorance) were present. 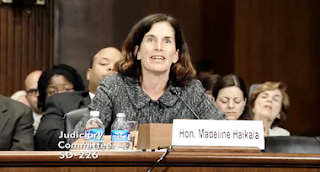 This much is certain: U.S. Judge Madeline Haikala stomped on any notion that justice can be achieved in Alabama's federal courts when she threw out criminal charges against Parker--after two juries had reached deadlocks. (1) Are white jurors so blinded by racial bias that they cannot issue just decisions? Americans have a tendency to get misty-eyed about our jury system, to feel that it's virtually sacrosanct and ranks as "the best system in the world." If that's the case, it's not because our system is noble and dependable; it's because all of the other systems are wretched. The trials ended with a jury split along race and gender lines. Ten white males pushed to acquit and two black female jurors pushed for guilty. Are white males in Alabama so blinded by bias against people of color that they cannot see what clearly is shown on video of the incident? (See video at the end of this post.) The images cannot be disputed: Parker used his left foot to perform a "leg sweep" that caused Patel to crash head-first to the ground. Multiple expert witnesses testified at trial that the leg sweep generally is not an authorized technique in American law enforcement, and relevant law clearly states that actions showing "reckless disregard" for a person's rights amount to the "wilfullness" required for a criminal conviction under 18 U.S.C. 242. To repeat our question: Are white males so blinded by racial bias that they cannot reach a verdict of guilty against a white police officer -- when the facts and the law clearly show such a verdict is justified? The only answer we can come up with is yes. (2) How blatant, and goofy, can judicial incompetence/corruption be, and what impact does it have on our justice system? Was Judge Haikala drinking, or smoking crack, when she presided over the case and wrote her opinion? From the record, it does not appear this was an issue at trial, and it's not clear if the officers ever asked Patel to present such a card. It certainly is not clear that Patel understood any such request. Is Haikala suggesting that Patel's failure to have such a card on him justifies getting his neck broken? Given the language barrier in the encounter, it's not clear Patel could have complied if he'd had a card. This much is certain: Nothing in the language surrounding 18 U.S.C. 242 ("Deprivation of rights under color of law") suggests the presence or absence of identification is a factor in determining an officer's guilt or innocence. So why on earth did Haikala make it an issue? United States citizens’ constitutional right to be free from a law enforcement officer’s use of unreasonable force is specific and definite. See Graham, 490 U.S. at 394 (“Where, as here, the excessive force claim arises in the context of an arrest or investigatory stop of a free citizen, it is most properly characterized as one invoking the protections of the Fourth Amendment, which guarantees citizens the right ‘to be secure in their persons . . . against unreasonable . . . seizures’ of the person.”) (emphasis added); Weiland v. Palm Beach Cnty. Sheriff's Office, 792 F.3d 1313, 1326 (11th Cir. 2015) (“A citizen’s Fourth Amendment right to be free from unreasonable searches and seizures includes ‘the right to be free from the use of excessive force in the course of an arrest.’”)(quoting Saunders v. Duke, 766 F.3d 1262, 1267 (11th Cir. 2014) (emphasis added)). The Constitution does distinguish in some respects between the rights of citizens and noncitizens: the right not to be discriminatorily denied the vote and the right to run for federal elective office are expressly restricted to citizens. All other rights, however, are written without such a limitation. The Fifth and Fourteenth Amendment due process and equal protection guarantees extend to all "persons." The rights attaching to criminal trials, including the right to a public trial, a trial by jury, the assistance of a lawyer, and the right to confront adverse witnesses, all apply to "the accused." And both the First Amendment's protections of political and religious freedoms and the Fourth Amendment's protection of privacy and liberty apply to "the people." In short, contrary to widely held assumptions, the Constitution extends fundamental protections of due process, political freedoms, and equal protection to all persons subject to our laws, without regard to citizenship. These rights inhere in the dignity of the human being, and are especially necessary for people, like non-nationals, who have no voice in the political process. David Cole knows what he's talking about; Madeline Haikala apparently has no clue. Perhaps she is jockeying for an appointment to the U.S. Supreme Court if Donald Trump is elected president. She would fit right in with his way of thinking. Once again, this is your court system on neoConfederate Capitalism. The Fourth International has determined that Capitalism cannot be reformed. Instead it must be replaced with a Socialist system. The Socialist Equality Party of the United States is the American affiliate of the Fourth International & Comrade Jerry White is running for President of the United States. Is there a federal oversight committee who reviews these types of judicial things? If so, do you know how it works? My God, this whack-a-doodle judge does blame the poor guy from India. Hell, he might have had the card on him, but he didn't understand what the cops were saying. I've watched pretty much the whole incident and video/audio, and I don't recall the cops ever asking to see an ID card. She's just making excuses for the cop who paralyzed the guy. Disgusting. Don't know much about history . . . don't know much about biology . . . but I do know about your question, SC. You can file a complaint against a federal judge with an august body that is called (I think) the judicial council. I think every circuit has one, but not sure about that. Anyway, I filed such a complaint against Judge William M. Acker Jr. in my employment case against UAB. Acker had granted UAB (technically, UA Board of Trustees) summary judgment, without allowing any discovery. That simply cannot be done under the law. Joel Dubina, chief judge in circuit at the time (and daddy of U.S. Rep. Martha Roby) ruled that Acker, who was 84 years old at the time (I think) was okeldy-dokeldy. Here is URL to two posts I wrote on the subject. As you can see, the system is not terribly effective. It's asking one judge to review another judge, and that kind of thing hardly ever works. Dubina simply produced a nice, tidy coverup. He had no interest in even trying to get at truth. Same thing probably would happen if someone filed a complaint against Haikala. I think any citizen could file one because the wrong party was the prosecution, and they represent "The People." (1) Judicial immunity -- judges cannot be sued, as long as they are acting in their official capacity. This is an invitation for corruption. It's judge-made law, and it must end, now. (2) Federal Courts Improvement Act of 1997 -- before '97, a case called Pulliam v. Allen allowed for injunctive relief against a rogue judge, forcing him to abide by the law. The judicial lobby hated Pulliam, and William Rehnquist led the effort to get it overturned. Congress needs to take steps to reinstate the provisions of Pulliam. In my view, wronged parties should be able to sue judges for money. But at the very least, we need a return to Pulliam. (3) Lifetime appointments on federal bench -- this is supposed to allow judges to act boldly, to stand up to powerful interests It does nothing of the sort. Again, it's an invitation to corruption. Must be ended. Two things we need: (1) A special unit in the DOJ to go after corrupt judges at federal and state levels; (2) Some form of citizen oversight in every state and judicial circuit. Appellate courts simply are not doing their jobs, and we need citizen oversight groups that can review rulings and at least force judges to get it right. In particularly ugly cases, they should have power to make referral for criminal investigation/prosecution. For now, we have an "honor system" that is run by dishonorable people. That doesn't work. So white male jurors caused the deadlock. I wonder how each one of them would feel if that leg swipe was pulled on their grandfather as he was walking down the street. Racism is alive and well in Alabama. The jury decision demonstrates that. Knocking an older person off their feet, as this police officer did, is not accepted practise any where that I can think of, which is a democratic reasonable country. In some places, where people feel the last vestiges of their "superiority" is being swept away, they will do whatever they can to maintain it, whether it works or not; whether its legal or not; whether it casts them in a poor light or not; whether it ever serves them in any great manner or not. The Judge again is simply part of a system which no longer works in many parts of the U.S.A. Its a shame because the concept of the American judicial system is great. Its some people who simply do not know how to get with the greater agenda who are screwing it up. I don't see how you make it out there in Rural Missouri, Roger. Living in a rural area is a dead end proposition for a native. All companies bring their senior management into rural areas from the city, but if you as a qualified person from a rural area apply for a job in the city, they cancel the job posting & repost it saying you must live in the city commuting area. I've had many companies do that to me, then hire my next supervisor from another area of the state or country & have him sit down and counsel me on the fact that I'm not supposed to be looking for work outside the area I live in, then tell me that my pay will remain at the minimum wage or close to it until I've a never ending list of additional expectations. This is why we need unions. Maybe I've given the wrong impression, Rob, but we aren't living in a rural area. We live in the third largest city in Missouri, after St. Louis and Kansas City. Springfield is roughly the size of Huntsville, AL -- about 20,000 smaller in population (164,000 to about 186,000, I think). It has one major state university, two small private colleges/universities, HQ for Bass Pro Shops and other corps. It's smaller than Bham metro for sure, but not rural. Sorry for the erroneous assumption Roger. My mind has been locked on this double standard kick all week. I just get pissed off at employers sometimes. In Northern Alabama, they will bring in less qualified people from other areas of the state & other states to lecture you & pay them insane amounts of money, but if you as a North Alabama resident ask for a job more than 30 miles or so from your front door, they start with all the excuses about they're concerned with how far away you are. Meanwhile, your boss who makes like 8 times what you do is driving in from Birmingham or Atlanta or flying in from New England to lecture you. Well, enough about that. Time to chill with some Smooth Jazz. Mexican Food & all that stuff White People didn't invent. Have a good one, Rob. Wish Carol and I could be there to join you.